Your answer to the following question might be “No, I have no idea what you’re talking about, I’m far too well-adjusted for that.” Fair enough. Let’s see. Do you know that feeling you can get deep in your gut that something is just wrong, just deeply, intensely wrong about what you’re doing? You don’t have words for it, you can’t articulate it very well. But when you try to focus on whatever you’re trying to do, or move it forward, you just want to recoil in horror or maybe revulsion – and in a way that seems wildly out of character and massively out of proportion. I’m not talking about those doubts that you can make explicit and then discuss with someone, or the usual stress that comes from doing something new or difficult. I’m talking about the rare sense of intense wrongness that can come over you in a way that feels physical. When that happens, all you can do is step back. You know in your core that something is wrong, and, if you can possibly put your tools down and step away from the workbench for a while before proceeding, that’s the thing to do. Before you make a mistake you can’t unmake. There’s a great example of this in the compelling documentary, Tim’s Vermeer. Tim Jenison is an inventor – but emphatically not a painter – who becomes fascinated with how Johannes Vermeer painted in the 17th century, and goes about trying to replicate his methods. 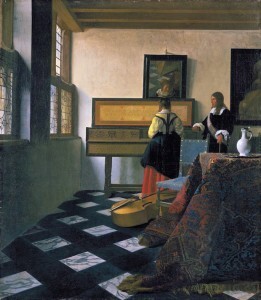 To put his theory about how Vermeer may have painted to the ultimate test, he… paints a Vermeer. He sets up a system of lenses, he replicates the room and the objects Vermeer painted in a San Antonio warehouse, and he sits down to paint what he sees in a little mirror. This guy is nothing if not dedicated. It’s kind of a weird day. Sort of a wave of revulsion swept over me. I just wanted to do anything in the world but sit here and paint for some reason. I don’t know… just one of those things. But I am pretty much ready for this painting to be finished. Turned out, he’d bumped the lens just a bit, so what he was seeing was in fact just slightly off from what it should have been. But it wasn’t until he slept on it that he realized what had happened, fixed it, and, clearly felt much better (even if it took him something like 20 more days to finish the thing already). Many of us will take a break in the next few weeks, get some downtime. When we step away and do something else – skiing, cooking, surfing, World of Warcraft, whatever – it’s amazing how that’s when we realize we we feel things are wrong in our bones somehow. Why we hate some idea we should love, why we just don’t want to take that opportunity we should in theory just jump at, why hiring that person who’s great on paper nonetheless seems like an epically terrible idea. When we let our brains do something else, they often shake loose the reason for our resistance. So, hopefully anything that’s been bugging you in the background lately comes to one of these lovely organic resolutions over the next couple of weeks. Happy holidays (if you’re celebrating), and happy new year! Image credit: “Jan Vermeer van Delft 014” by Johannes Vermeer. Licensed under Public Domain via Wikimedia Commons.